dealing with a self-managed superannuation fund. View these ten strategies online, and purchase your copy of Estate & Business Succession Planning, 6th Edition from our website today. Bernie O’Sullivan, CTA, is Principal of Bernie O’Sullivan Lawyers, an independent law firm that specialises in wealth succession. He advises individuals and their advisers in regard to estate planning, superannuation, family trusts and business succession, and acts in disputes relating to these arrangements. 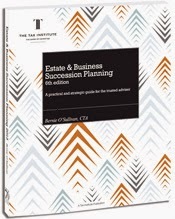 Bernie is the author of Estate & Business Succession Planning, now in its sixth edition, and a regular presenter at The Tax Institute’s seminars and conventions.